Before we get started with Part 3, let’s just sit back and relax and enjoy the different versions of Part 2 (posted here) sent in by you all! I know I have certainly enjoyed seeing your work. 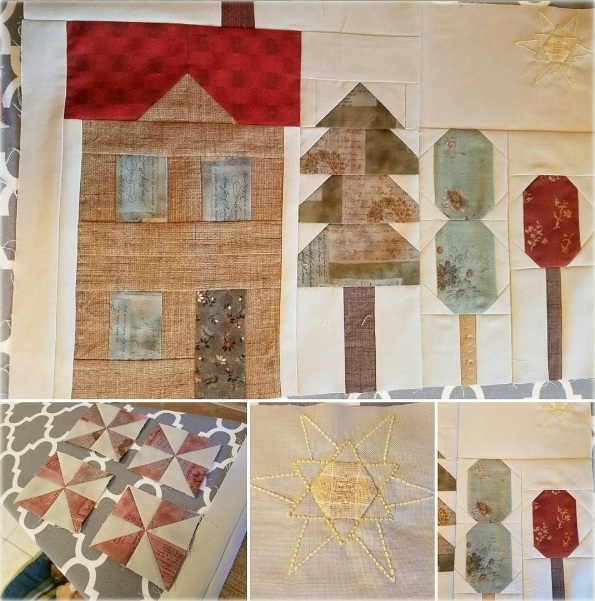 Here is mine – using Quilting Treasures’ Bleecker Street fabric group! Click here to view fabrics. 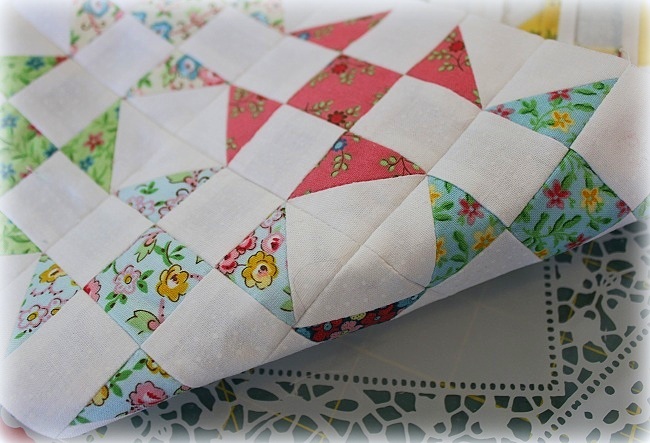 If you are new and wondering about the quilt kits, click here for information. Here is Alice’s. 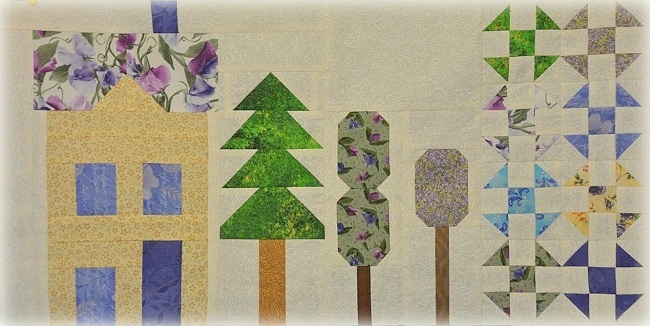 She blogs at http://aliceinquilterland.blogspot.com if you would like to visit her and make a new quilting friend. Here’s Sharon’s mini. 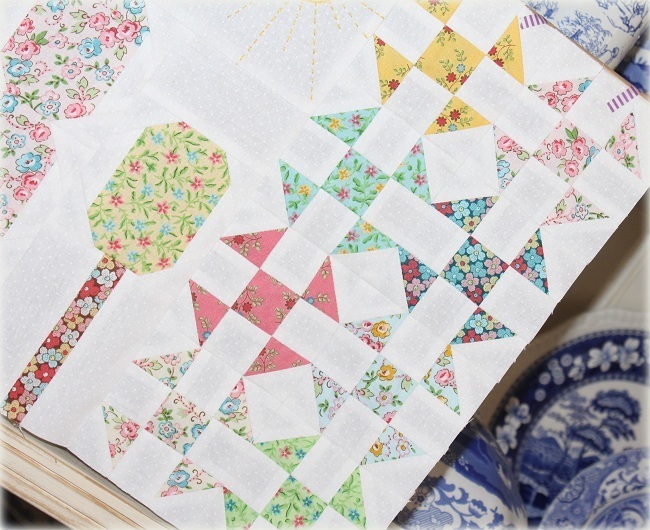 Instead of incorporating each part of the quilt to make a quilt, Sharon uses each part to make a mini. VERY creative. You may follow Sharon’s work on her blog here. 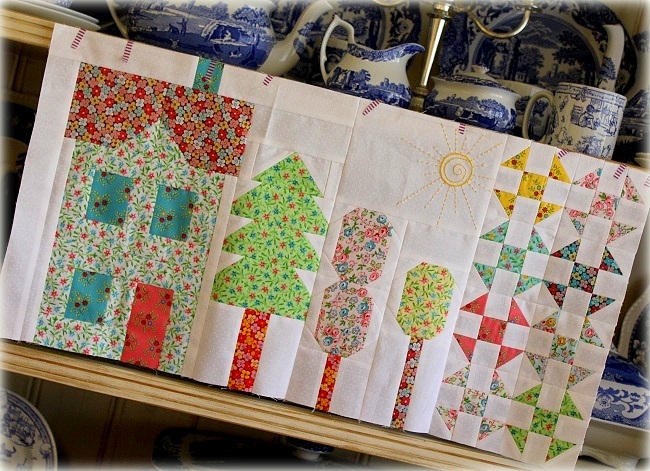 Seeing how your quilts unfold as we progress in this Sew Along is one of my greatest joys. I am VERY happy that you are sewing along. You can send me pictures of your quilt at any stage at any time, and I will just include your pictures in the next posting of Spring on Bleecker Street. 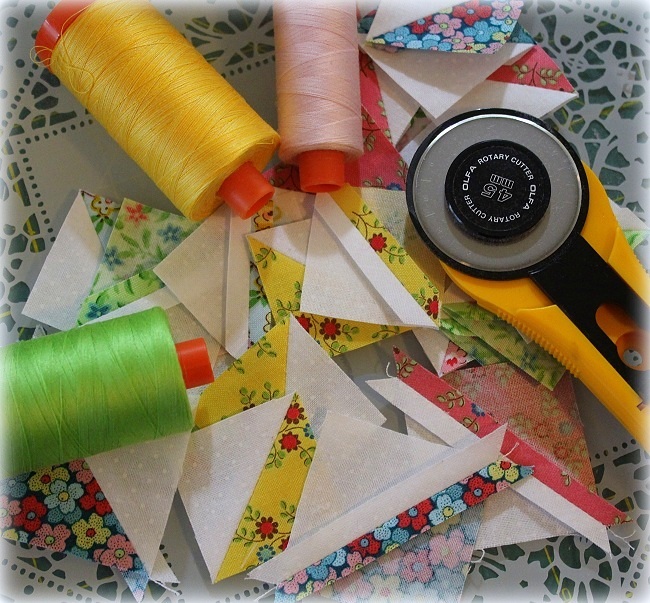 Remember, this is a sew-along for those of us who have more projects we can count, all going on at the same time. :-) So, absolutely no pressure to get things done on time. More importantly, I just want you to enjoy the project. The theme of this part remains to be “Keep Calm and Sew On” because we will be sewing with small pieces (just like in Part 2). The trick in dealing with small pieces is to handle them as if you are handling normal pieces. Keep calm – check your cutting, your machine, and you should come out just fine! #1. 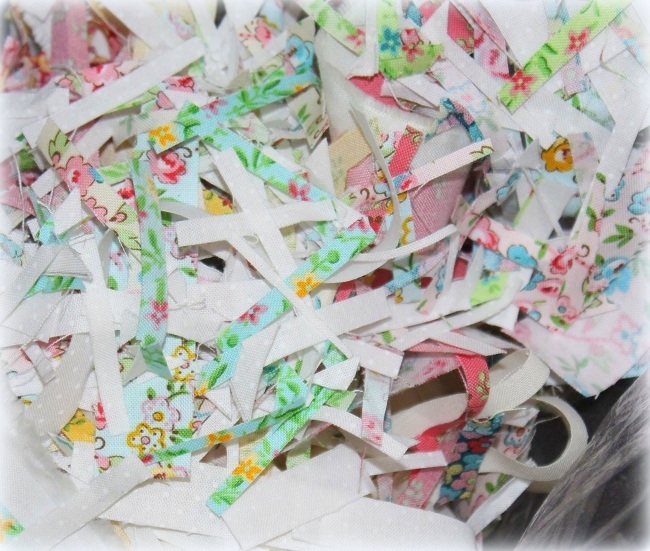 I do starch press my fabrics so that I keep the small pieces as non-distorted as possible. #2. I also finger press all my seams before heat-setting them. Part 3 deals with half-square-triangles units. They are special and precious because they will be finishing at 1″ — therefore, you will be making HST units that measure 1 1/2″ raw edge to raw edge. I cut my starting squares at 2 1/4″ x 2 1/4″ instead of the conventionally prescribed 1 7/8″ x 1 7/8″. That way, I can trim them to the unfinished size. I make my HST units as normal…. but I press my seams open. Then, I align the diagonal seam of my HST units against the 45 degree angle of my quilting ruler. I trim the excess so that the HST units measure 1 1/2″ x 1 1/2″ raw edge to raw edge. Alright…. when I constructed the individual rows, I butted the seams between units. 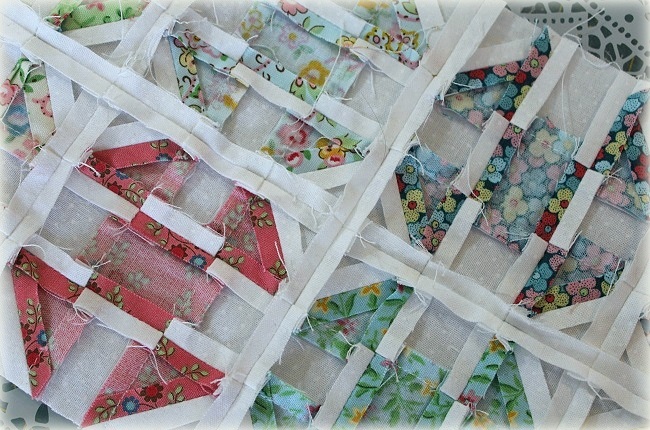 But when I sewed the rows together, I finger pressed, then iron pressed the seams between rows OPEN! Again, that reduced bulk, plus, it helped me to piece accurately the shoo fly blocks. 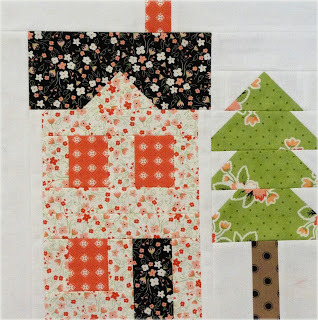 When I pinned the shoo fly blocks together, I made sure the points match at the top of the triangles of the units – very much like matching the seams when we made the house roof in part 1 here. I pressed open the seams in between rows to even out the bulk. I then added the shoo-fly assembly to sections made for Part 1 and Part 2 of the sew-along. Oh — and watch my quilt grow, and yours too! And that’s it for Part 3! I hope you will have a blast making progress on this quilt as much as I have! 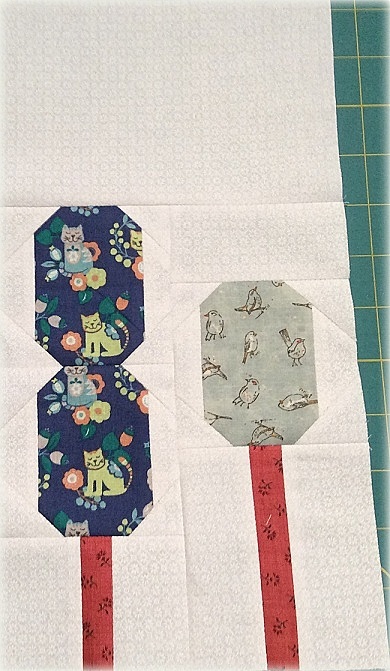 know the units are small, but I am hopeful that by making these small shoo fly units will help confidence in tackling small pieces in other quilt projects of yours. Can’t wait to see what your Part 3 looks like!!!! Happy Sewing, my sewing friends!! Hugs to you all. 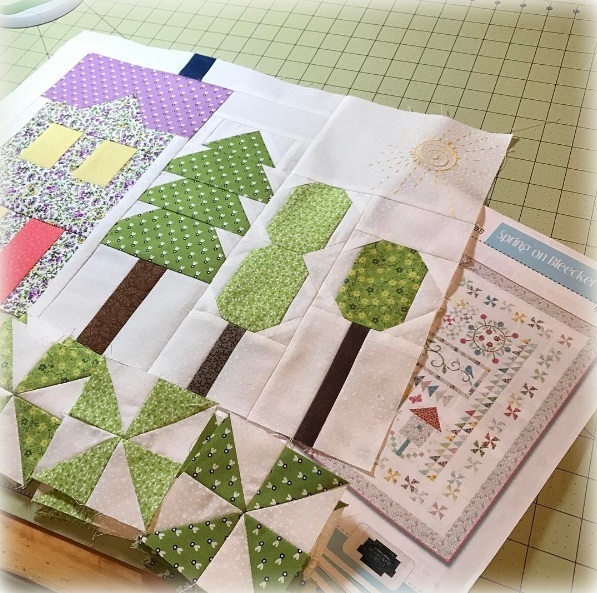 This entry was posted in "Scraps" Projects, Quilt kit, Quilt Pattern, Quilting, Quilts & Projects: Published, Quilts: Pieced & Applique and tagged Bleecker Street Fabrics, Calicos, Quilting Treasures, Sew Along, Wendy Sheppard Designs. Bookmark the permalink. 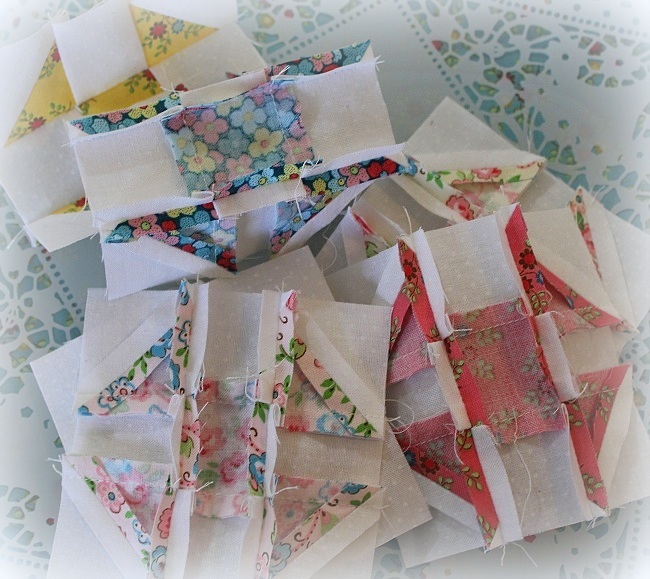 Lovely blocks….I sent you an email with my photo over a week ago…..it may have been too ugly to post….I think I’ll start over again with different fabrics. I’m not happy with it…better to re-do now than go any further. Happy Easter! I continue to be unsuccessful in downloading the instruction. When I click on “here” it goes to a blank page. Can you give me the specific url to download the instructions? I am so goofy. 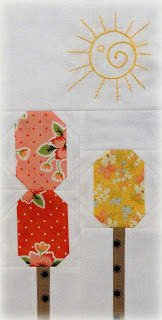 I did the shoofly blocks instead of the pinwheels!! Oh well, pinwheels this time it is. I need to get my sun in there too. It is fun to look at all the different variations. Nice! What a neat idea to save the trimmings in that way! where do I go to find the embroidery patterns for Spring on Bleeker Street – they are not included with the downloadable pattern?